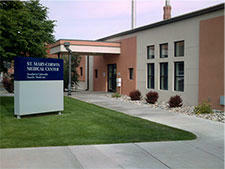 In October 2015 in Pueblo, CO, the staff members of a primary care medical clinic – Southern Colorado Family Medicine at the St. Mary-Corwin Medical Center – start asking parents of newborn babies to kids five years old about the parents’ adverse childhood experiences and the resilience factors in their lives. They ask the same questions of pregnant women and their partners in the hospital’s high-risk obstetrics clinic. The results are so positive after the first year that the clinic starts asking parents of kids up to 18 years old. The plans are to do the same in the hospital’s emergency room. Why? They think it gives kids a leg up on a healthier start in life. They think it helps adults understand and manage their own health better. They think it helps physicians better understand and help their patients. Oh yeah – and it looks like it’s going to save money. Probably a lot of money. New medical care. True story. Early this year, a young couple – she’s 29 years old and he’s 30 — shows up at the Southern Colorado Family Medicine (SCFM) clinic, which serves low-income families. She’s three months pregnant. They’ve just moved to Pueblo to be closer to his family. Neither have a job, nor any prospects. He’s disabled, and they’re living in a motel room with a disabled family member. Before the woman is examined by an obstetrician, Chantalle Trujillo-Navarrete, the clinic’s family development specialist, asks the couple about their lives, which is how the information above came out. 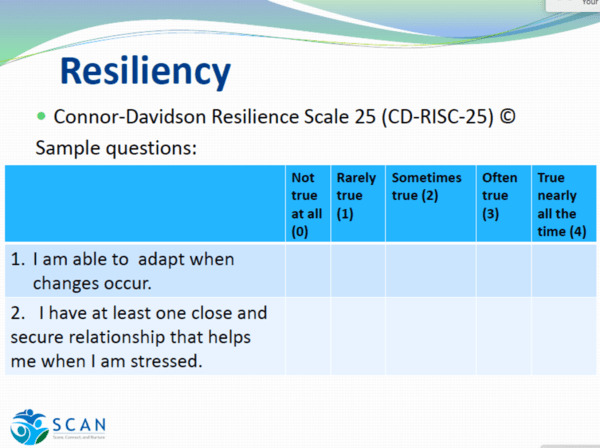 She also asks about their ACEs – their adverse childhood experiences, and does a resilience assessment. So, if you’re this soon-to-be mom and dad – with a lot of trauma in your past that already gets in the way of how you handle stress – how are you feeling? You’ve got no job. Hardly any money. You just moved to a new town. You’re camped in a tiny motel room that you’re sharing with a family member you’re taking care of. You’re about to have your first baby. You’ve got no crib, no diapers, no baby clothes, no supplies. How overwhelmed do you feel? And what are the odds of your baby getting everything it needs if you’re feeling completely overwhelmed and stressed about life? Trujillo-Navarrete refers the couple to a case manager at Catholic Charities, who helps them find a home and a car. Trujillo-Navarrete also arranges for disability support and transportation for the disabled family member. The family enrolls in several parenting and family empowerment programs that help them develop parenting skills, as well as skills in managing their finances, finding work, and accessing the resources they need in Pueblo, all with a goal of becoming independent. They’re told that after the baby is born, they’ll receive home visits for four to five months to make sure they and their baby are receiving what they need, and they’ll learn how to be healthy parents, since they don’t want to pass on their ACEs to their child. They receive basic supplies for the baby: diapers, baby wipes, some clothes, a car seat. After they’re settled, the woman tells Trujillo-Navarrete that she feels calmer because she knows she and her husband can provide a solid start for their child. The couple says they never would have known about any of these services if they hadn’t come to the clinic for a prenatal checkup. Their baby boy was born a month early, which raised alarms because the mother said a previous pregnancy had resulted in her baby being stillborn. But at a newborn checkup earlier this month, it was clear that the baby is thriving. The family will continue to receive supports through Healthy Steps, a national program started by the Commonwealth Fund, the American Academy of Pediatrics, and Boston University that includes a developmental and behavioral specialist who works with the parents and pediatrician at every well-baby checkup, a parent hotline, home visits, support groups for parents and families, counseling for parents, referrals to children’s specialists, and social services. The couple also understands that the clinic is now their medical home. Medical with a capital M. Because at SCFM, medical doesn’t mean what’s going on only in your body. It means what’s going on in your head. Your heart. Your spirit. Your life. And how what happened to you as a child affects all of that. Here’s the traditional medical care version of this story. Mom-to-be and dad-to-be show up for an appointment at a medical clinic. Mom has a checkup with an obstetrician. Dad waits in the waiting room. She’s told when to come back for her next appointment. They go back to their motel room, frantic, isolated, and worried about how they’re going to provide for themselves and their baby. Just how did the idea for this radical (but oh so logical) approach to medical care come about? Sixty percent of SCFM’s 10,000 patients (17,000 patient visits/year) are low-income and Latino, most of whom are covered by Medicaid and Medicare insurance. Many are addicted to heroin, and thus many babies are born addicted. “About two years ago, during a barbecue at work, the residents told the medical director and Jayne Mazur, St. Mary-Corwin Health Foundation director, how frustrating it was to deal with the addiction issues they were seeing, because they felt helpless to do anything to prevent them,” says Cindy Lau, violence prevention regional planner at the foundation. Mazur told Lau about that conversation. It gnawed at Lau: What could they do differently? 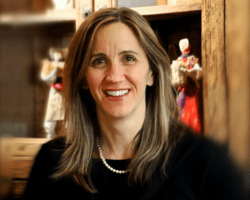 The answer came last year when Dr. Julie McCrae, then associate research professor at the University of Denver’s Butler Institute for Families in Denver, pitched an idea to Mazur and other administrators at St. Mary-Corwin’s: Would you consider integrating a new understanding about adverse childhood experiences science into a primary care clinic? McCrae had come across the 1998 CDC-Kaiser Permanente Adverse Childhood Experiences Study (ACE Study) in 2014, and thought it was a “rubric that explained a lot of health conditions”. Dr. Robert Block, the former president of the American Academy of Pediatrics, goes a bit further. “Adverse childhood experiences are the single greatest unaddressed public health threat facing our nation today,” he says. Quen Zorrah, a nurse consultant for the Nurse-Family Partnership program in Washington state and pioneer in integrating ACEs science into a public health clinic and home visiting, takes yet another step. “ACEs science is a social justice issue,” she says, because parents have the right to know the most powerful determinant of their children’s future health, safety and productivity. And yet only a relative handful of physicians have integrated ACEs science into their practices. The CDC-Kaiser Permanente ACE Study and subsequent surveys that show that most people in the U.S. have at least one ACE, and that people with four ACEs— including living with an alcoholic parent, racism, bullying, witnessing violence outside the home, physical abuse, and losing a parent to divorce — have a huge risk of adult onset of chronic health problems such as heart disease, cancer, diabetes, suicide, and alcoholism. Brain science — how toxic stress caused by ACEs damages the function and structure of kids’ developing brains. Health consequences — how toxic stress caused by ACEs affects every part of the body, leading to autoimmune diseases, such as arthritis, as well as heart disease, breast cancer, lung cancer, etc. Historical and generational trauma — how toxic stress caused by ACEs can alter how our DNA functions, and how that can be passed on from generation to generation. Resilience research — how the brain is plastic and the body wants to heal. This research ranges from looking at how the brain of a teen with a high ACE score can be healed with cognitive behavior therapy, to how schools can integrate trauma-informed and resilience-building practices that result in an increase in students’ scores, test grades and graduation rates. McCrae wanted to educate the clinic staff about this science and to have them start asking patients about their ACE scores to help improve their health and to prevent ACEs in their children. Most medical directors would probably have listened politely to McCrae’s request, shown her the door, and muttered about naïve young researchers with idiotic ideas. But St. Mary-Corwin’s didn’t. Within six months, the ingredients for a successful pilot fell to place: the medical director supported the idea, a new management team at SCFM embraced it, they secured a year’s worth of funding – just under $45,000 — from The Caring for Colorado Foundation. “In talking with other practices and other physicians, I don’t think it’s real typical to have this quick of an endorsement,” says Lau. They named the project SCAN — Score, Connect and Nuture, which has since been changed to Support, Connect and Nurture. It would take place in SCFM, in partnership with Catholic Charities. 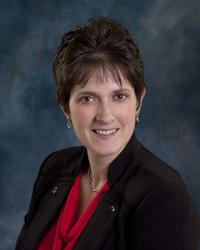 Dr. Leslie Dempsey, who had just joined SCFM before the project was put into place, was designated to lead the project. She’d never heard of ACEs. They searched across the U.S. for another primary care clinic that had already integrated ACEs science. They couldn’t find one. Everyone they spoke to said they wanted to do a program, and asked the SCFM staff to let them know when they figured it out. Some parts of the program were obvious: Everybody – about 50 people (physicians, medical residents, nurses and front office staff) — learned about ACEs science and trauma-informed practices. This meant moving from a “what’s-wrong-with-you” to “what’s happened to you” approach to caring for patients. It meant understanding that people bring their childhood traumas with them wherever they go, and that their lives have often been bent and contorted by the consequences of ACEs. They learned about the SCAN program and its goals. All staff members also learned about their own ACEs, and did an anonymous assessment voluntarily. This normalized the science, and showed that almost everyone has ACEs. Clinic staff reported no adverse reactions; a couple of people who were so interested that they wanted to be more involved. The physicians and residents were also trained on how to improve their comfort level to initiate a conversation about ACEs with patients, including how ACEs affect patient health and parenting. They were also trained on the resources the newly hired family development specialist (FDS) could provide for parents. The five staff physicians were given separate training in implementation science, which included the importance of developing and using best practices, and setting up a committee to oversee how the program was working, and making adjustments to improve quality. “I envisioned patients breaking down and being in my office for two hours, not 20 minutes. It’s not that I didn’t think it was important, but I didn’t see how we could handle it. “It didn’t turn out like that at all,” she says. How does this new thing, which almost everyone thought would gum up the works, fit into the flow of a medical clinic? The process starts with a family development specialist (FDS), says Jodi Hasenack, SCFM’s supervisor for RN clinical practice. The FDS is a social worker who knows the resources in the community that are available to families. She sits down with parents who are bringing their child in for a well-child visit, explains the basics of ACE science to them, and gives them the 10-question ACE assessment and a 25-question resilience assessment (available in Spanish or English). She gives the results of both to the physician, who reviews it before talking with the family. Besides the ACE and resilience assessments, the FDS also asks parents about housing, employment, food, etc. 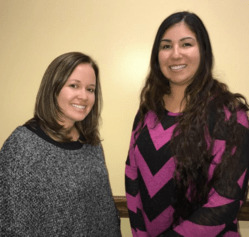 If their children are newborn to three years old, says Trujillo-Navarrete, besides housing services and baby supplies, they’re eligible for Healthy Steps. For parents with children older than three, they’re offered programs through Catholic Charities, including parenting classes, cooking classes, how to manage a budget, how to buy groceries to feed a family of four, and other resources. Although most people want to participate, says Trujillo-Navarrete, some are wary, mainly because of their previous experiences with social services, where they feel they’ve been judged as being “bad people” because they were asking for help. Because of their knowledge of ACEs science, and having done their own ACE scores, Trujillo-Navarrete and the other staff members understand that people aren’t born bad, that they aren’t responsible for what happened to them as children, and that the ways they chose to cope were appropriate, given that they weren’t offered healthy alternatives. So, they are genuine in offering them services, and in believing that people can change, as the science has shown. The ACEs and resilience assessments also help physicians and residents make better decisions. In one case, the parents of a two-year-old scored high on the ACE assessment, low on the resilience assessment. They also said they were living with a lot of stress. So, their physician, who understands that a combination of high ACE score, low resilience and living with toxic stress is a triple-whammy for derailing a child’s development, changed the next well-child visit from a year, which was normal, to a follow-up in three months, and provided the parents with the resources they needed to relieve the stress they were experiencing. The big surprise was how much emergency room visits dropped — 29%. One person’s ER visits dropped from 20 visits before doing the ACEs and resilience assessments to just five visits. And the no-show rate for appointments dropped for people who were scheduled for three or more appointments. Physicians and residents say that having parents do the ACEs and resilience assessments helps them broach topics that were difficult to talk about before they learned about ACEs science and began using the assessments. It also helps to know that community resources can be provided, they say. And, says Dempsey, it has completely changed their vision of what health is, and how to help people be healthy. “We’re learning that it takes more people with different backgrounds to fully address a person’s health,” she says. The 10-question ACE assessment may not be capturing all the traumatic experiences that SCFM patients are experiencing, says McCrae, because the FDS has reported that patients are bringing up other childhood adversities. The clinic may also need to ask the same question in different ways. 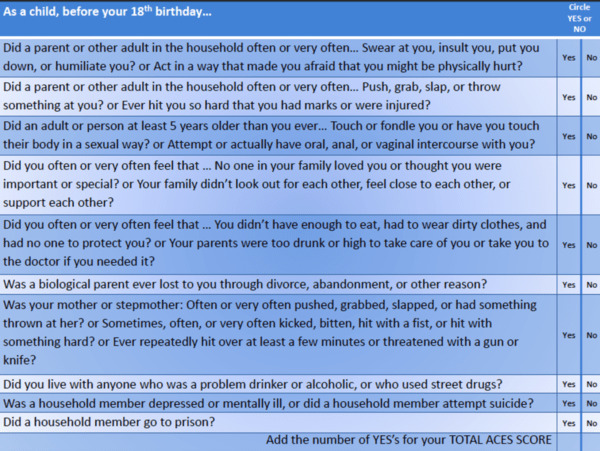 In fact, adding more ACEs to surveys and assessments is happening in pediatric clinics and social service agencies that have integrated ACEs science, as well as with some ACE surveys, such as the Philadelphia Urban ACE Study. For example, the Center for Youth Wellness in San Francisco has added six questions, including bullying, racism and involvement with the foster care system. Roseland Pediatrics in Santa Rosa, CA, which serves a mostly immigrant population, asks if a person has lost a family member to deportation. And the Family Services Center in Nashville, TN, breaks up the sexual abuse question into three separate questions. One of the goals of SCAN was to spread the information and approach to other parts of the hospital, and to other family and pediatric practices in Pueblo. “It’s not naturally spreading,” says Lau. “It’s a slow process to get things accepted.” Other clinics, agencies and programs in Pueblo have been introduced to the ACEs science and the work that SCFM is doing. At this point, none of these organizations have been interested in integrating ACEs into their programs and systems. Nevertheless, there’s been a ripple effect. Catholic Charities is now including ACEs science in their parenting classes. Pueblo’s version of Project Launch, a national program to ensure that children enter school ready to learn, has “the SCAN model all over it”, says McCrae. A couple of pediatric practices are also interested in integrating the model. Based on its successes, the clinic received another round of funding in July — $355,000 for three years — from Catholic Health Initiatives. In the new grant, the half-time FDS position has expanded to two full-time positions. The ACE and resilience assessments are being given to parents of newborns to age 18, and soon will be given to parents of children in the emergency room. They’re expanding a farm stand program to provide patients with more fresh vegetables and fruits. They haven’t discussed expanding the assessment to all patients in the clinic, but, says Lau, based on what they’ve learned over the last year, it makes sense. A huge benefit and impact is with the six new family medicine residents from St. Mary-Corwin’s, a teaching hospital, who train in the clinic every year and learn about ACEs science. This makes a lot of sense on many levels to me. I wonder whether, as an intentional part of the interview or for large-scale studies, asking parents about their childhood adversity is also a risk factor, and hopefully that can be mitigated, for child abuse. What I mean is, childhood abuse itself tends to run in families, but obviously, people aren’t very likely to admit to abusing their own children. This is fantastic for this area, but being prior military, and living in 15+different places, this is NOT the norm . I would like to add that high ACE scores don’t just apply to people of low income or status. My own family of origin, was military. There was a lot of dysfunctionalism, violence, and my stepfather was an abusive alcoholic. We weren’t poor, my stepfather was pretty high ranking. I wish this kind of questioning was the Norm for all people, with all insurance, everywhere. As much as I applaud this move, I am disheartened by the fact that this is still an insurance issue. Insurance companies and some medical professionals don’t want to know or ask these sort of questions. In America, it seems as if there is a whole industry based on only helping after the fact…and that’s only if you have the right insurance. If not, you are left behind. The CDC-Kaiser Permanente Adverse Childhood Experiences Study had 17,000 participants, most of whom attended college, and all of whom had jobs and great health care. 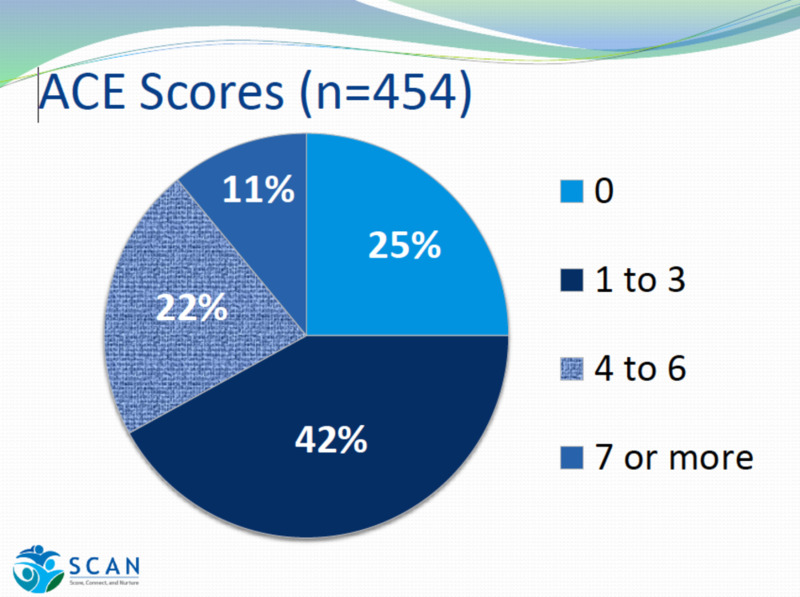 Most of them had at least at ACE score of 1; 12% had an ACE score of 4 or higher. Although moving often was not included in the 10 ACEs that were measured (and there were other types of trauma such as racism, gender discrimination, bullying, witnessing violence outside the home, being an immigrant, being homeless, etc. ), it can certainly be an ACE. As more people are learning about ACEs science, there’s more movement to include it in all organizations and systems. Federally funded community health centers can be an avenue for adding screening. Yet, a strong network for follow up services will be needed as well. Is the American Academy of Pediatrics on board? That’s another avenue for action. I think the move of incorporating ACEs into primary care and other areas where we can address the trauma and stress people have experienced is definitely moving in the right direction. However, the elephant in the room is that many of these areas in the ACEs are preventable. We are not as a society implementing positive policies to address the basic needs and resources for families so we have not really effectively removed the burdens either. Our current society has moved further awat from fairly addressing health equity for our populations, and instead there is a feeling of personal blame, failure, and other negative stereotypes that are assigned to individuals and families of color, minorities, and of low socio-economic status especially in our current health sick care system. We collectively as health care professionals ethically and professionally need to call out the inequities faced in our country among individuals and families who are burdened with unfair systems and policies that negatively impact their health as currently demonstrated and measured through ACEs. To me, this is a Call to Action, for all health care professionals to collectively identify it is important to prevent ACEs, but in doing so this means investment in policies supportive of families, living wages, housing, educational opportunities, day care accessibility, etc.